Arrest of CIA Agent Sheds Light on American Covert War in Pakistan, Straining U.S.-Pakistani Relations (Part II) | Democracy Now! U.S. officials have admitted an American detained in Pakistan for the murder of two men was a CIA agent and a former employee of the private security firm Blackwater, now called Xe Services. Up until Monday, the Obama administration had insisted Raymond Davis was a diplomat who had acted in self-defense. The arrest of Davis has soured relations between the United States and Pakistan and revealed a web of covert U.S. operations inside the country, part of a secret war run by the CIA. The Guardian of London first reported Davis’s CIA link on Sunday and noted that many U.S. news outlets knew about his connection to the CIA but did not report on it at the request of U.S. officials. We speak with Declan Walsh, the Pakistan correspondent for The Guardian, who first broke the story. Watch Part I of the interview. AMY GOODMAN: As we go back to Declan Walsh, again, his forthcoming book, Insh’Allah Nation; first revealed Raymond Davis’s link to the CIA in The Guardian newspaper. Declan, you were just talking about what Raymond Davis — what it’s believed that he did and how it is that he ended up killing these two men. DECLAN WALSH: That’s right. I was just saying that the U.S. argument about who Davis was seems to be subtly shifting now in the news coverage. I see a number of reports today quoting officials in Washington who are stressing the fact that Raymond Davis, while employed for the CIA, was not involved in intelligence collection or espionage, but was purely providing this security function. And I suspect — I haven’t confirmed this, but I suspect that this is the U.S. government trying to stave off any possible espionage charges against him, because as his CIA affiliation has now become public, it’s becoming clear that it’s going to be extremely difficult for the U.S. government to have Raymond Davis released under diplomatic immunity. You know, according to the U.S. government, as President Obama has said, they’re making this sort of technical argument, effectively, that Davis was registered as a diplomat, therefore deserves immunity. But in a country like Pakistan where anti-Americanism is extremely high and public sentiment is very aroused on this issue, it really seems extremely — I would say, in the short term, it’s highly unlikely that Davis is going to be released. It’s hard to see how that would happen without creating huge damage to the civilian government here. So it seems that at this point the U.S. is very much trying to prevent any further charges being leveled against him. Right now he faces two counts of murder, one of possession of an illegal weapon. And they certainly don’t want an espionage charge to be added to that. AMY GOODMAN: Can you talk about the pictures that were found on his camera of facilities near the India border, photos of madrassas, as well? DECLAN WALSH: Yeah, that’s right. There were a number of photos, I believe somewhere in the region of 15 or 18 photos found on his camera. Some of those photos were pictures of the people he killed during that roadside confrontation in Lahore. After shooting the two men dead, Davis stepped out of his car and took photographs of both of their bodies. And when the police looked at the camera, they also found a number of images that appear to have been taken, I believe, around Peshawar and also around Lahore. Some Pakistani officials have taken a pretty dim view of this. They seem to see these photographs as part of surveillance, of his surveillance or intelligence collection activities. And U.S. officials have a more benign explanation of it. They’re saying that Davis was involved in basically scouting out activities where U.S. covert officers could carry out their work. But either way, these images have actually been leaked, at least in part, to the Pakistani media, and we’ve seen some of them on the television here already. 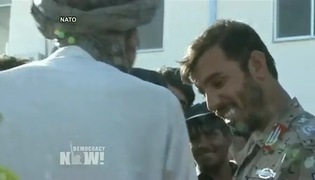 AMY GOODMAN: The significance of a CIA agent working in Lahore with the U.S. forces in Pakistan is something also that Jeremy Scahill, our colleague, Democracy Now! correspondent, author of Blackwater, has been reporting for a year, with the administration absolutely denying it. But what this shows about the U.S. presence in Pakistan and how the Pakistanis are responding to this? DECLAN WALSH: That’s right. I mean, well, what seems clear is that Davis was, as I said, a former Special Forces soldier. He’s someone who came to the CIA through that route. Now, there has been some speculation that basically military units, under this unit called J-S-O-C, JSOC, which Jeremy Scahill has reported on, has been working in conjunction with the CIA in Pakistan, carrying out these intelligence activities. Either way, you know, these things are extremely incendiary in the Pakistani public mind, if you like, because for many Pakistanis, they see U.S. assistance as very much a two-pronged thing, if you like. On the one hand, you have these very public engagements between the top political and military leaders in America and Pakistan, you have these multi-billion-dollar aid programs. On the other hand, you have these covert activities, such as the CIA drone campaign in the tribal belt and now, of course, this CIA safe house in Lahore, and the activities of the people inside it have been blown open. And at the very least, this is not only embarrassing for the CIA, but it also tends to sort of reinforce the worst prejudices and ideas the Pakistanis have about the American presence in their own country and about Americans’ motivations for being there. AMY GOODMAN: And finally, who the men were that he killed, this suggestion that they were ISI agents that were tailing him, or not, and then the divisions this has meant in the Pakistani government, the speculation in Pakistan that the former foreign minister, Shah Mehmood Qureshi, was excluded from the Pakistan cabinet because of his position on Raymond Davis? DECLAN WALSH: Again, Amy, this is another of the, you know, great unexplained mysteries of this case. Not only do we not know really why Raymond Davis opened fire on these two individuals, but we also don’t know exactly who they were. I mean, the Lahore police have confirmed that these people were, if you like, small-time criminals. Both of them had criminal records. They were carrying illegal weapons. But there have been these persistent suggestions, sourced to Pakistani officials, saying that they were somehow involved with Pakistan’s ISI spy agency and that they had basically been under orders to trail this man in order to ward him off or to harass him, because, as they said, he had crossed some sort of unspecified red line in relation to his work. So, whatever the truth of this matter is, what’s very clear is that this whole furor has really badly damaged relations between the ISI and the CIA. The ISI openly admits that there is a huge trust deficit between the two sides. And there have been a number of incidents over the last couple of months that demonstrated this already. In November, the CIA station chief in Islamabad was forced to leave after his name appeared in a civil lawsuit in the courts. Some of the Americans said that the ISI had leaked his name. Previous to that, the ISI — Shuja Pasha’s name had appeared in another civil lawsuit in a New York court, and the Pakistanis were furious about that. So, really, we’re seeing the relationship between these two organizations really reaching a low. And this instance seems to be pretty much the climax of that. AMY GOODMAN: Well, thank you very much, Declan Walsh, for joining us, and look forward to reading your book, Insh’Allah Nation. Declan Walsh writes for The Guardian of London. He’s based in Lahore, Pakistan. And he first revealed Raymond Davis’s link to the CIA in The Guardian newspaper, before that, working for Xe, or Blackwater. Thanks so much, Declan.